I first met Peter Rees in September 2010 at a book launch. He was accompanied by Ted Pickerd who, Peter told me, had served with Bomber Command. I was overawed as I spoke to Ted briefly about his experiences and pleased when Peter explained that Ted would feature in the account of Australians in Bomber Command that he was working on. Peter and I subsequently enjoyed sporadic email contact and he kept me posted on the progress of his work. Last year, I had the pleasure of reading and commenting on an early draft. If I was overawed by Ted’s experiences in our brief chat, I was overwhelmed when reading about them, as well as those of his Bomber Command compatriots, in Lancaster Men. The Aussie Heroes of Bomber Command. In this fine account, Peter follows the general course of the war, and includes the full gamut of wartime episodes: recruitment and training, crewing up, combat, flak and attack, bailing out, capture, injuries, death and return. The Pathfinders, Dambusters and Great Escapers are included. Even Q for Queenie’s harbour bridge stunt gets a mention. He discusses the bombing of Dresden, long considered the darkest moment of the bombing campaign, and places it in a new perspective. He includes historical commentary where appropriate, but the personal stories, such as those of Rollo Kingsford-Smith, Jack Davenport, Noel Eliot, Jim Rowland, Jack Mitchell, Mickey Martin, Alick Roberts, Blue Connelly, and Ted Pickerd, are the heart of his book. As he demonstrated in The Other Anzacs: Nurses at War, 1914–1918 and Desert Boys. Australians at War from Beersheba to Tobruk and El Alamein, Peter is a natural story teller. When drawing together a large collection of stories, there is the risk that the multitude of individuals will be lost to the reader. Not here, or indeed in Peter’s other works. He skilfully inks in the pen portraits so the reader can instantly identify each man; he seamlessly blends their words into a moving and dramatic narrative. The concept of duty is almost alien to us these days and yet Peter Rees’s 20-year-old (or thereabouts) heroes were firmly committed to participating in a far away war. The remarkable thing about this dedication is that, from almost the first day of training, through to their inclusion in 1000 aircraft bomber raids, powering through flak, searchlights, enemy fighters and even ‘friendly’ attack from the machines above them in the bomber stream, it is made clear that they are expendable. Somehow, those brave men accepted that expendability and the potential inevitability of a death which, other than in the privacy of their own thoughts and diaries, was treated blithely. Someone went for a Burton, someone had gone west, and in the case of Noel Eliot’s brother: ‘All killed—funeral at one-thirty this afternoon!’ It indeed says much about these men that, despite this prevailing attitude, they continued to climb into their mighty machines, even those like Alf Read who saw a Lancaster rear gunner hosed out of his turret. In their case, Aussie Hero is not a false accolade. Rollo Kingsford-Smith reappears a number of times and, in a sense, becomes a key ‘commentator’ of the Bomber Command experience as we share his beliefs, thoughts, practices, grief at the loss of a friend, and the searing ignominy of ‘boomeranging’ from a bombing op when the electrics failed in the rear turret. He would have gone on if the turret itself or guns had failed but with the outside temperature below –40 degrees Celsius, the rear gunner was prone to frostbite and, within a few hours his efficiency would be suspect. The entire crew would be at risk if he could not defend them from attack. It was the right decision, but, as a leader who would grill any other pilot who made a similar decision, Rollo felt ashamed. ‘It took me a week before I could safely lift my head again’. One of the strongest threads is that of comradeship, evident from the first moments of the crewing up process where men who had little in common created an instant bond. They effortless worked as a team during the long hours of each bombing operation, adhered to rigid flight discipline in the air, and enjoyed lighter moments in the mess. So strong was the bond that some men extended their own tour so they could fly one more time with their crew. Sometimes, it was literally their last flight. There was striking recognition of the dangers a Jewish crew member would face. When Eric Rosenfeld asked the RAF what he should do if captured by the Germans, he was told to tell them he was a British officer and a gentleman. It wasn’t good enough for Eric’s skipper, Noel Sanders. With typical Australian ingenuity, he organised a set of fake, Anglicised dog tags for his navigator to wear on ops. Just in case. At 135,000 words Lancaster Men is perhaps a little longer than readers are used to these days but there is no sense that this has been overextended or padded. It has a well constructed, pacey narrative that never sags. The text is supported by a good selection of photos, many supplied by the families of Peter Rees’s key subjects, two decent maps, a useful index, notes and bibliography, and a great cover. There is only one flaw, to my mind. Peter’s original title was All the Fine Young Men. That was rejected by Allen & Unwin, who decided it should be called Lancaster Men. Catchier title perhaps, but Peter’s fine men also flew Hampdens, Whitleys, Stirlings, Manchesters and Wellingtons. In excluding those who flew other aircraft from the title, the marketers have somehow diminished their experience and resulted in at least one non-sale: one friend of a Stirling pilot refused to buy the book because he thought it only covered Lancaster aircrew. Rollo Kingsford-Smith makes a telling point when he refers to the monotony of ops: dangerous they may be, but they are all the same. Go out, dodge flak, AA and defenders, drop the bombs and hope you get home again. Perhaps that is why, in the canon of aviation literature, there are relatively few bomber command memoirs and biographies, when compared with the constant action, fire-at-the-whites-of-their-eyes Fighter Command tales. 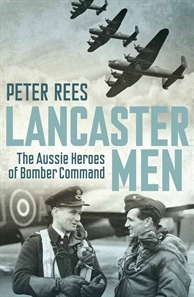 In bringing together a multitude of smaller stories in this first class work, Peter Rees not only highlights the key experiences of the individuals, he illuminates the entire Australian experience in Bomber Command. This is a fine tribute. Highly recommended.